You won't believe your eyes when you step into Studio B. It's where you'll find our onboard ice-skating rink, not to mention our professional ice shows, which are a "must-see." Featured on our Voyager-family ships, Studio B is also home to other onboard activities, like game shows, onboard parties, cooking demonstrations, and more. Once onboard, you can check your Cruise Compass and Daily Planner for the day's schedule of events. Impressive is an understatement. Our incredible ice shows feature a cast of professional skaters from around the world and you have the chance to see them throughout your cruise vacation. Because of the shows' popularity, some require complimentary tickets to be presented at the door. If that's the case, just visit Guest Services or check your Cruise Compass and Daily Planner. When the professionals aren't practicing or putting on one of their remarkable shows, we have open skating hours for onboard guests. There's no charge to use the rink, no reservations necessary and all levels of skating are welcome - we'll even provide the skates. First time on the ice? We offer skating lessons for beginners. Or, if you've been at this for a while, you can join us for special Advanced Skating Sessions. We also offer Family Skating, Teen Skating, and even Disco or Rock 'n' Roll Skating. We request that all skaters wear long pants and socks for their own comfort and safety. See your Cruise Compass and Daily Planner for ice show times and open skating hours. Closed for skating during ice show rehearsals and other scheduled events. 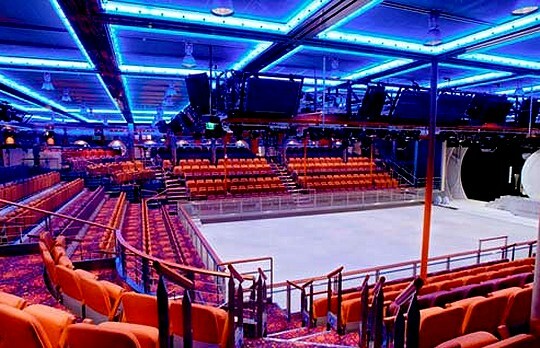 Voyager of the Seas was the first ship on water to have an onboard ice-skating rink.